The Prairie State Generating Company (PSGC) is pleased to announce that it has been recognized by the National Mining Association (NMA) for receiving independent certification under its CORESafety® system. PSGC joins eight other companies that have had operations independently certified under NMA’s signature safety initiative. “As a fourth generation coal miner, I’ve seen the transformation that safety programs and processes have taken across the coal mining industry. Our work with the NMA has been beneficial to everyone at the Lively Grove Mine. We look forward to continuing this partnership, collaborating with our industry peers, and promoting the safety and health of every miner,” said Paul Krivokuca, Senior Vice President of Mining at PSGC. CORESafety is a risk-based mine safety and health management system developed by NMA. CORESafety participants agree to: commit to the CORESafety system; implement a functionally-equivalent version of the CORESafety safety and health management system; submit to NMA annual self-assessments of progress toward implementation of the CORESafety safety and health management system; and, if the company elects to become or maintain CORESafety certification, complete a thorough third- party assessment of its safety and health management system to verify that it is functionally equivalent to CORESafety and submit the assessment report to NMA. Predictive Safety SRP, Inc., based in Centennial, CO, conducted the independent audit for Prairie State. 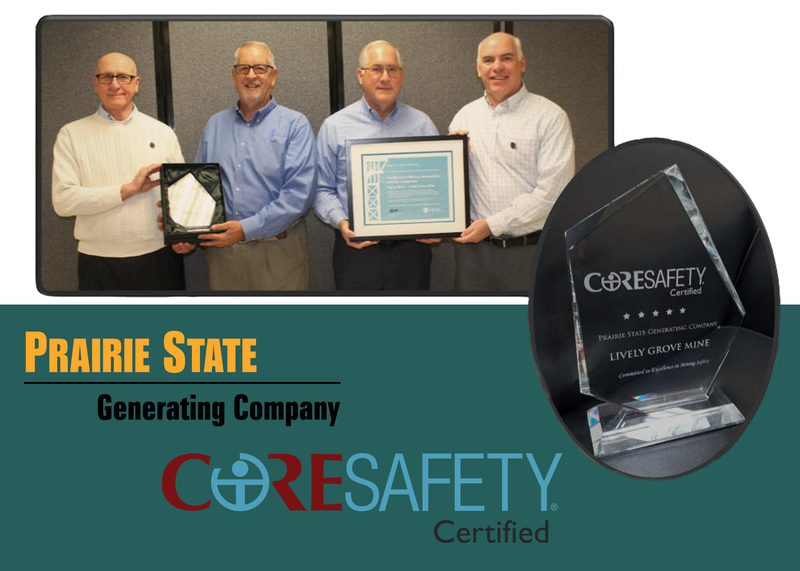 From left: Tom Harman, Senior Director of Health and Safety for NMA presents Prairie State’s Paul Krivokuca, Don Gaston, and Randy Short with the CORESafety certification.